Personalized medicine in oncology is founded on the concept of rational care and management of individual cancer patients based on and tailored to the unique biomolecular features of both the patient and his/her tumor. The vision displaces, or at least modifies, the traditional approach of classifying tumors originating from a given anatomic site in the same way—typically categorizing them by type, grade, and stage—and treating according to a standard (of care) treatment regimen. The traditional approach has been largely uninformed by the biomolecular uniqueness of tumors within the same category, has ignored the biological uniqueness of the patient, and has been rife with unpredictable treatment failure. The hope for personalized medicine is that comprehensive molecular categorization of a patient’s tumor accompanied by a molecularly targeted therapeutic strategy tailored to the tumor’s unique molecular aberrations and the patient’s unique pharmacogenomic and other biomolecular traits will achieve far better results. Inherent to this approach is up-front molecular analysis of the tumor, often accompanied by parallel analysis of normal tissue from the patient. On the patient level, these tumor and normal tissue specimens, the primary sources of the molecular information that drives their personalized care, are the most personalized part of personalized medicine. On a systems level, these biospecimens and the data derived from them are the fuel that drives the vision of a learning healthcare system in which patient care and research connect in a continuous feedback loop that enables progress in unprecedented ways to unprecedented heights. They are invaluable resources for personalized medicine in oncology. 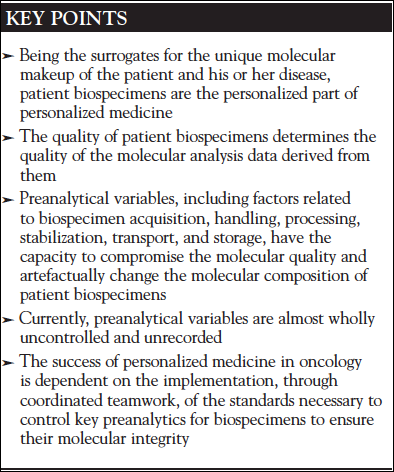 Patient biospecimens are, quite simply, the sine qua non of personalized medicine. The concept of molecularly directed medicine has long been cogent, elegant, and appealing, but it never could have been realized without the stunning technology development that has made it possible to generate and analyze colossal amounts of molecular analysis data rapidly, efficiently, and accurately. Advances in biomolecular analysis technologies and information technologies have transformed both the biomedical sciences and the practice of medicine. These technologies have provided unprecedented power to probe disease pathobiology, uncover meaningful associations amid vast data sets, and provide new insights into the functional significance of molecular characteristics. Thanks to these technologies, the amount of clinically meaningful and biologically significant data that can be generated from patient biospecimens has increased by orders of magnitude. The power of these sophisticated analysis platforms, however, has raised the biomolecular quality bar for the biospecimens that are the starting materials. With continuing technology development, analytical methods are moving rapidly from uni-analyte to multi-analyte and “omics” testing, increasing quality requirements for biospecimens even further. With a view to ensuring accurate results that enable confident decision-making, extremely close attention is paid to the accuracy of the testing method. To this end, numerous regulatory mechanisms are in place throughout laboratory medicine to rigorously assure the performance of testing devices, the standard operating procedures used to execute tests, the environment in which tests are done, and the proficiency of the people performing the tests. However, there is insufficient focus on the object of the test itself, the biospecimen from the patient. Even if the test, the lab, and the personnel all perform flawlessly, the test result still will be wrong if the test object (the biospecimen) is corrupted. Astonishingly, relatively little attention is paid to this issue. The quality bar for patient biospecimens still remains at a level that is commensurate with the generation of interpretable histopathology (a low bar). Many of the factors that alter the molecular integrity of biospecimens are known, and best practices to prevent or limit detrimental effects on specimens have been developed by authoritative sources such as the National Cancer Institute, the Clinical and Laboratory Standards Institute, and the International Society of Biological and Environmental Resources. However, none are enforced or widely practiced in clinical medicine. The single exception is the set of guidelines developed by the American Society of Clinical Oncology (ASCO) and the College of American Pathologists (CAP) for breast cancer specimens intended for HER2 overexpression testing.1 With these guidelines, attention was drawn to the fact that the results of molecular testing may be artefactually altered by key preanalytical factors related to the acquisition, handling, and processing of breast cancer specimens. Tests for overexpression of HER2 in breast cancer are companion diagnostics that serve as the gateway to a potentially lifesaving, albeit expensive and potentially toxic, targeted therapy. Therefore, neither false-negative nor false-positive test results are tolerable as both are associated with substantial risk to patients. Under these circumstances, maintenance of specimen integrity to assure accurate test results is paramount, and the ASCO-CAP guidelines, enforced through CAP, mandate control over key variables in biospecimen handling and processing to ensure that breast cancer specimens are fit for testing. Clearly, the same assurance of specimen fitness would be reasonable, if not indispensible, for all companion diagnostic tests or, indeed, any molecular test that influences decision-making and patient management. So what are the key “preanalytical variables” in the life cycle of a biospecimen that contribute most heavily to molecular quality? Can they be controlled, and if so, who would control them? Collectively, all of the iatrogenically induced, nonphysiological conditions to which biospecimens are exposed prior to analytical testing are known as “preanalytical variables.” These include numerous events in the preacquisition, acquisition, handling, processing, and transport of biospecimens. Different variables have differing ability to alter the molecular quality and/or composition of biospecimens. They affect different specimen types and different classes of biomolecules in different ways and to different extents. Some of these variables occur while the biospecimen is still viable and capable of reacting to the extreme biological stresses that iatrogenic interventions present to them. This would include surgical manipulation and intraoperative drug exposure as well as ex vivo handling and processing of the excised tissue. Other variables apply after the biospecimen has been “stabilized” in some fashion to stop biological activity, such as fixation in formalin. While the specimen is viable, its biomolecular composition may be altered through changes in gene expression, protein translation/modification, or other intracellular reactions occurring in reaction to physical, thermal, and pharmacological pressures. At any time during the biospecimen lifecycle, from beginning through long-term storage, molecular integrity may be compromised through hydrolytic, oxidative, or even enzymatic degradation. Additional molecular alteration may occur as a result of chemical stabilization steps, most commonly fixation in formalin. Some of these variables can be controlled, others cannot, but all those of key importance should be recorded as documentation of the provenance of the biospecimen, which can help to determine if the specimen warrants (ie, is fit for) specific types of analysis. It is unclear exactly why the requisite attention to preanalytics has been lacking in molecular medicine and biomedical research alike for so long. In medical practice, there are obvious challenges related to the potential alteration in workflow, increased effort and augmented costs for surgeons, pathologists, and other professionals who play key roles in the biospecimen lifecycle to control and/or document key preanalytical factors. More significant, however, is the overall lack of awareness of the impact of preanalytical factors on laboratory error in general and of biospecimen preanalytical factors on molecular analysis in particular. In biomedical research, many investigators are similarly unaware of the issue. They have little to no knowledge of the type and degree of procedural variation occurring in medical practice that might be affecting the patient samples they analyze and could not control it if they had. When patient samples fail to perform well in analysis or yield irreproducible research data, preanalytics are rarely invoked, largely because they are unknown/undocumented. The time has come to address the issue of preanalytics in a definitive fashion. The success of personalized medicine is at stake. Preservation of specimen quality is a time-sensitive and labor-intensive endeavor requiring immediate attention to and prioritization of specimen handling in every case, for every patient. It is a front-loaded activity, but there is no alternative. Once lost, biospecimen quality cannot be retrieved. Education and teamwork will be required to successfully address this challenge. Surgeons, surgically related specialists, pathologists, nursing staff, and professional assistants must work together to develop and implement changes in practice that will ensure the quality of personalized medicine’s most important resource: biospecimens from our patients. Important steps in this direction are already being undertaken. The Pre-analytics for Precision Medicine Project Team (PPMPT) within the Personalized Healthcare Committee (PHC) of CAP was initiated following a national multistakeholder convergence conference sponsored by the National Biomarker Development Alliance (NBDA) and the establishment of a memorandum of understanding between NBDA and CAP. With the support of PHC, multiple additional CAP scientific resource committees, and CAP leadership, PPMPT has reviewed all relevant scientific literature referable to key preanalytical variables for tissue, blood, and cytology specimens in everyday pathology practice. Based on their findings and informed by other authoritative sources of expert guidance for preanalytics, PPMPT is developing practice metrics and documentation guidance for pathologists that are evidence-based but practicable enough for broad implementation in CAP-accredited laboratories. PPMPT has also begun a joint effort with the Commission on Cancer of the American College of Surgeons to develop guidelines for the control of “cold ischemia time” of surgically resected cancer specimens through the coordinated efforts of surgeons and pathologists. Cold ischemia time is the elapsed time between removal of the tissue from the body (to a “cold” or room temperature environment) and stabilization of the tissue by fixation or freezing. Because it is highly biologically stressful for tissue and is inversely proportional to molecular quality, it is widely regarded as the most critical preanalytical factor.2 Thus, immediate “hand-off” of resected tissue from surgeon to pathologist followed by efficient short-term handling and processing to stabilization to control cold ischemia time would, alone, dramatically improve the molecular quality and consistency of cancer specimens. Indeed, the work of defining the practice metrics to safeguard biospecimen quality is under way, but significant implementation challenges still lie ahead. The ultimate aim is to ensure that all patient biospecimens in all practice settings are fit for molecular analysis in the practice of personalized medicine. For personalized medicine in oncology in particular, assurance of tumor specimen quality in every case is essential. Accurate data for optimal patient management and quality care depend on it. Fundamentally, it is our responsibility to our patients to achieve this goal. Wolff AC, Hammond ME, Hicks DG, et al. Recommendations for human epidermal growth factor receptor 2 testing in breast cancer: American Society of Clinical Oncology/College of American Pathologists clinical practice guideline update. J Clin Oncol. 2013;31:3997-4014. Hicks DG. The impact of pre-analytic variables on tissue quality from clinical samples collected in a routine clinical setting: implications for diagnostic evaluation, drug discovery, and translational research. Methods in Pharmacology and Toxicology. 2014;20:259-270. Graig LA, Phillips JK, Moses HL. Biomarker Tests for Molecularly Targeted Therapies: Key to Unlocking Precision Medicine. Washington, DC: National Academies Press; 2016.